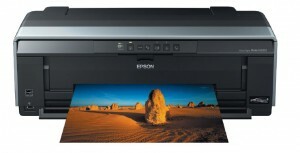 Epson announced the Stylus Photo R2000, which effectively replaces the Epson R1900. The new printer uses the same UltraChrome Hi-Gloss 2 pigment ink set as the R1900. The defining feature of this inkset is the Gloss Optimizer that sprays prints with a clear top coat. This coating reduces or eliminates bronzing in dark areas, and what is called gloss differential in areas of white. The R2000 uses larger, 17 ml ink cartridges. The larger tanks will offer the convenience of fewer cartridge changes over time. The same Red River Papers offered for the R1900 will work wonderfully in the R2000. ICC profiles will be available. Epson R2000 vs. Epson R3000 Which to Buy?